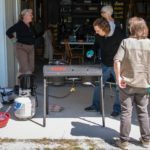 The Guild held a program on Natural Dyeing at Green Pastures Farm on April 8, 2017. 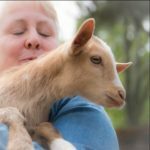 Green Pastures Farm is in Prosperity, SC. Everybody dyed 4 mini skeins of Merino wool yarn in 4 colors: Black Walnut (harvested from our Farm), Marigold and Hibiscus (harvested from Debby’s dye garden), and Cochineal. We also enjoyed pizza baked in our outdoor brick oven and then was plenty of time for hugging baby goats!